The publisher blurb begins, "In March of 1975, as New York City hurtles toward bankruptcy and the Bronx burns, newsman Coleridge Taylor roams police precincts and ERs." Taylor is down on his luck. Once the top reporter on the police beat in New York City, he now works obituaries. He doesn't belong behind desk, and so he spends his time visiting the hospitals and police stations, hoping to catch a story that will get his name in the headlines again. A side and overarching story which will likely flow into the next novel is the reason Taylor ends up sitting at the obits desk. He is determined to clear his name and gain back his reputation. When a body is brought into Bellevue, Taylor immediately knows something is off. The young man, although dressed in homeless garb, is a little too clean to have been living on the streets. Sensing a story, he begins to follow whatever thread he can to find out the truth. Who was the victim? Who killed him? And why? With the help of fellow reporter Laura Wheeler, Taylor follows a trail that leads him deep into the homeless community and into the heart of the wealthy where he finds corruption and betrayal. I suspected I would like Last Words when I first agreed to review it, but I didn't realize just how much. 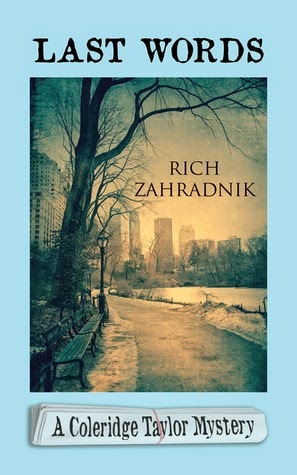 Author Rich Zahradnik has created richly drawn characters, both the major ones and the minor ones. Taylor may seem ambitious, and I suppose he even believes he is only out to get the story to save his reputation, but he clearly has a good heart. He believes in the truth and going out of his way to bring justice where it is needed. The reader also sees a more personal side to Taylor, his careful control of his drinking, his memories of his brother who was lost to the Vietnam War, and living in a trailer outside his own house. He's definitely got issues, and that makes him all the more interesting of a character. I am quite fond of Laura Wheeler, another reporter, who, unfortunately, because of the time period, isn't being taken as seriously as her skills and intelligence deserve. She is very capable, however, and part of me hopes she shows up that patriarchy that holds women back in future novels in the series. Yes, I know she's not the main character in the series. But one can hope. One of the aspects I loved most about this novel was the sense of time and place. I felt transported back to 1975, right to the streets that time period. The political, economic and social climate of the era feels palatable. I saw parallels between now and then, particularly for the newspaper business. In 1975, newspapers were suffering because of the popularity of television, forced out of business and merging to survive. Today it is the internet. Last Words was an enjoyable mystery, atmospheric and suspenseful. This is one of those books I hope gets lots of attention. It deserves it. Source: I received a print copy of this book from the publicist with Meryl L. Moss Media Relations, Inc. for an honest review. I love the sound of this book! I don't think I would have picked it up based on the synopsis alone but your review makes it sound very good! Athira - I really enjoyed this one, Athira, and am looking forward to reading the next book in the series. With a name like Coleridge Taylor, how could I resist this new series by an author I've never read! Thanks, Wendy! Jenclair - I hope you do get a chance to read it, Jenclair. I would love to hear what you think. Fingers crossed you like it as much as I did. Sheila - This is my favorite mystery read of the year so far. One of the wonderful things about blogs is that we to show case books that do not always get as much attention as they warrant. Great review, thank you for featuring this. Tracy - That's very true! I love finding gems like this and being able to share it with others. Thanks for highlighting a new-to-me title and author! I lived in NY during the 60s and 70s, so I think I am a great target audience for this story and hope to get a chance to read it sometime. Rita - I'd be curious to know what you think of it, Rita, given your having lived in New York at that time. I hope you get a chance to read it! This sounds like a good one, with an interesting setting. Nice review! Naida - Thank you! The author did such an amazing job of making me feel like I was right there in New York City. I've not heard anything about this author or his books. This sounds like a book I'd enjoy. Thanks so much for sharing, Wendy! Melody - He's worth checking out, Melody! I'm definitely adding this to my list based on your recommendation. I love finding a good book that's the first in a mystery series. Irene - There are advantages to starting a series at the beginning as it is being written. I hope you like this one if you do read it. I would love to know what you think of it if you do. I'm glad to hear that you enjoyed this one so much! I love a good historical mystery so I can't resist adding this one to the TBR list. Samantha - I hope you do get a chance to read it. It is on the darker side, but that's part of what makes it so good, I think. I love the sound of this! It's always such fun to have a book not only live up to expectations but surpass them. Thanks for sharing! Definitely adding it to the TBR! This sounds a fun read, thanks for introducing me to it. I do like the character's name!